What hardware is part of your desk setup? 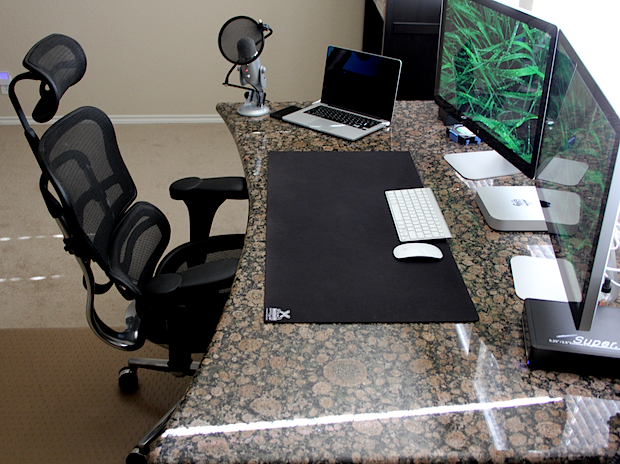 The desk itself is a custom granite piece. It’s 3/4″ throughout, and 1 1/2″ on the edges, and weighs about 400 lbs. It was a blast moving it half-way across the country as well as upstairs. What do you use your Apple gear for? Currently, it’s used for email, web, music. I’m a cubicle warrior by day, although my gear isn’t really used for that. I’ve recently started diving into Photoshop, Final Cut, and Xcode. Specifically, I’m playing around with a couple of ideas for iOS apps. I’m also trying to get more into podcasting. What apps do you use most often? Do you have a favorite app for Mac or iOS? Understandably, the core OS X apps get used most, although being a huge music nut I find iTunes is definitely my must-have app. I deal with a lot of zip/rar files, so The Unarchiver is one of my more commonly used applications. As a multiple desktop user, I’m also big on BetterSnapTool. On the iPhone, I’d have to say Alien Blue (a Reddit client) is my favorite app. Finally, for people like me who are constantly toggling back and forth between apps, ClipMenu for OS X is critical (editor note: we have covered ClipMenu here, it’s one of our must-have Mac utilities). I typically use iPhoto for photo management, but I’m also trying to spend more time in Aperture. Do you have any helpful personal or tech tips you want to share? For me personally, as I spend a lot of time at my desk, my biggest suggestion would be to buy a comfortable chair (like this one shown above ). Just as important, get up at least once an hour and stretch your legs, it also helps with blood flow to the brain and ensures you’re full of fresh ideas. Technically, a Mac Mini with an SSD boot volume and an on-board Time Machine drive (with this kit ) (along with 16 GB of RAM) is a powerhouse. They are so incredibly capable. I was initially concerned about trying to drive two Thunderbolt displays with the Mini, but it does the work with no hiccups or latency whatsoever. Finally, Dropbox is an absolute must-have for people who constantly go back and forth between multiple PCs and Macs. Do you have a Mac setup that you want to share with OSXDaily? Answer some questions and send us a few pictures, you can find more details here! Or browse past featured setups instead. I’ve always liked the Mini, but I figured it to be underpowered. Then I look at these specs with 16GB RAM, SSD, and two screens? I bet that thing blows my MacBook Air out of the water. I would think the Retina MBP is faster though right? Owner here, I was concerned about it driving two TB displays, but it works fine. The processor is exactly the same as the one in my MBPr. The performance is about the same. The Mini has 16 GB of RAM, the MBP has 8 GB. Mostly, I got tired of docking and undocking the MBP, so I decided to re-do it and add the Mini for a more permanent setup on my desk. Hey, I’ve seen your setup on Reddit! Drop box a necessity? I’ve always used sharing between computers.. Three, iMac, MacBook Air and a Mac Pro. Simply drag and drop. Most of us have multiple computers in different geographical locations. Dropbox is seamless, no need to constantly map drives. Oh, you mean something more like my family room setup? 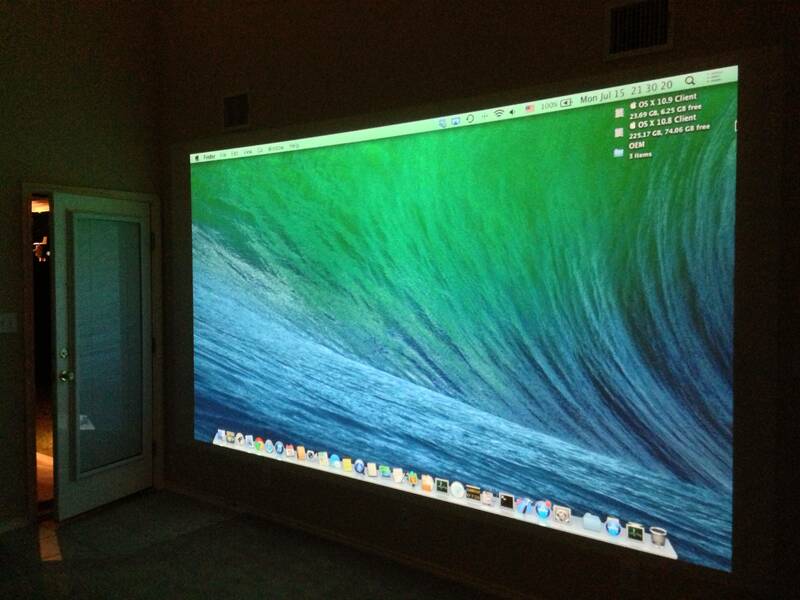 It’s an Optima 720p projector, shooting onto a wall about 14 feet away. The diagonal screen size is just over 120″. Epic setup, can’t wait until thunderbolt goes retina!! 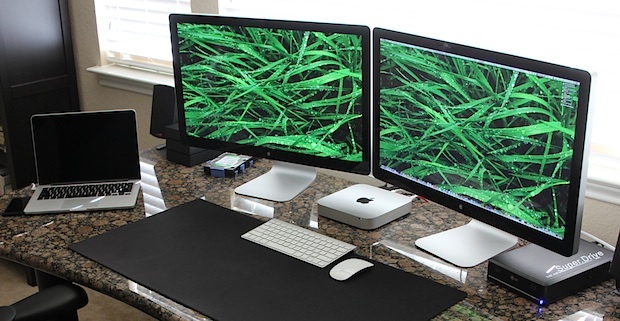 I have the same setup, 2012 Mac mini with dual Thunderbold displays. I docked with a rMBP for some time too. I was concerned with power so I went with the quad core i7 version, put in 16 GB RAM, and configured a “home made 1TB fusion drive” with the stock 1TB drive coupled with a 256 Samsung 840 Pro Series SSD. Let me tell you, it screams! I love it! Yes, I don’t have a huge video card, but I’ve found it makes no difference for what I do at all. I have a 2013 13″ MacBook Air base model for travel with Dropbox…. happy camper. Sounds like we have very similar setups. Don’t underestimate those Minis, man, they’re awesome. It still blows me away how much of a difference the RAM and SSD make for the overall performance. Plus, it’s incredibly cheap to do so. I would rather keep the separate 500 GB traditional drive reserved for TM backups, otherwise I’d absolutely configure it as a Fusion Drive. Neat setup! One question, what brand/model is that large mouse pad you’re using in the center of your desk? Doh! It’s in the comments, apologies! “It’s in the comments…” It is? Where exactly in the comments is it? I’ve read all twelve of them (twice now), and can’t find it. 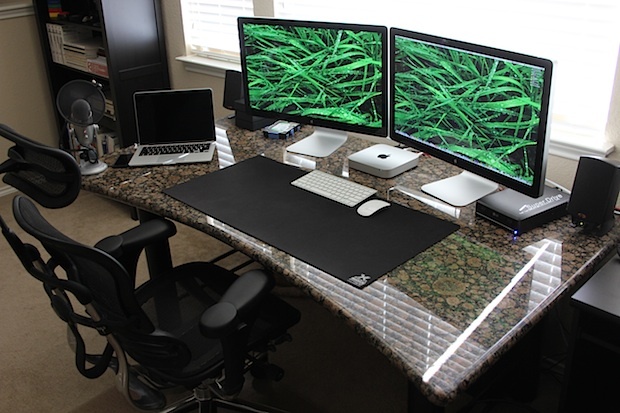 Or maybe you (or the owner, or someone else) could answer directly; what exactly is the brand/model (cost) of that gigantic black mouse-pad/wrist-rest looking thing, in the front-center quadrant of your gigantic custom granite desk? Oh, to have that much space, by the way (but without the weight). Maybe it could be clarified further in the article itself, or desk accessories could be listed separately? Or are people just skimming? Doh! article not comments, I completely skipped the “XTracPads Ripper XXL mousepad” part in the article several times and it wasn’t until after posting I realized. Wow what an awesome desk, both hardware and the physical desk itself is just beautiful. Where do you even get a piece of granite that size? Do you have to have it custom cut? And what on earth is it resting on to support 400lbs of rock plus the hardware? I imagine it cost a small fortunate based on the price of granite countertops for a house… but would love to know more. Sorry bro, I never noticed this comment before. My brother-in-law used to run a granite business. They would do custom pieces for countertops, kitchens, etc. He had about 6 desks like this in the office, mostly to impress customers. When he downsized the business, I asked for one of the desks. The entire thing is custom. 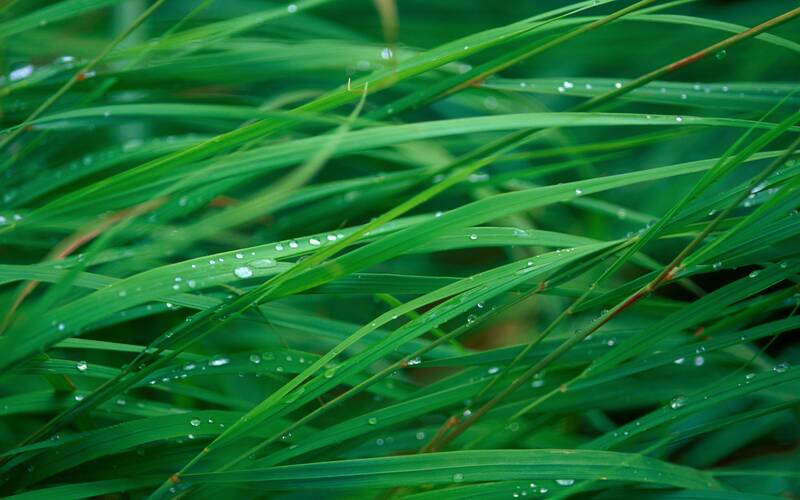 It’s 3/4″ thick throughout, and there is another 3/4″ buildup along the edges to make it appear as though it’s 1 1/2″. There is a piece of 3/4″ wood glued to the underside, the metal legs are then bolted to it. Granite is incredibly strong, I have stood on the desk before and it holds my 190 lb. weight just fine. I would imagine it would cost well over $1,000 to have something like this made. He told me if I could haul it away I could have it. I got it for free about 9 years ago, I definitely plan on keeping it forever. The size is damn near perfect for what I do, and I especially like the arc in the front. Dumb question here but what wallpaper are u using ? I have to ask because I genuinely want to know… but is a $650 computer chair really worth $650? Do you get that much comfort out of it? Is it better for your back or posture? I use a kind of junky generic office chair, I have long wondered if the fancier chairs are worth the hefty expense. Absolutely it is. I can find myself sitting for 6+ hours at a time. A comfortable chair is key. I realize $650 is not in every persons budget, but don’t just buy any chair. Find one which is truly comfortable. This is a great setup, Patrick. It is definitely something I want to duplicate in my home office when I upgrade from my 2010 27-inch iMac. Thanks so much for the inspiration!! A 27″ iMac? You’re no slouch yourself, they are truly beautiful machines. My Mom recently went from a Dell PC to a 2009 21″ iMac, she never knew what she was missing out on. Me I ask the height of the table? It’s 36″ from the floor to the top of the desk. Thanks for posting this. Sweet setup. Wasn’t sure whether I should pickup a MBPr or Mac mini. This post confirmed my choice. I’ll be hooking up a: Mac Mini 2012 i7 quad 2.3ghz w/ 16gb ram 256 SSD to 2 Dell 24 inch panels (U2414H). Perhaps down the line I’ll pickup a MBPr or MBA to work on the go. But I’m usually working from home anyway. Thanks for the really useful post Patrick. @Kevin, I’m thinking of the same sort of set-up as yours. I’ve ordered the Mac Mini (similar config but more SSD) and am looking at 2 Dell 24 inch monitors too. Have you you got your set-up working? If so, how is it please? I’m wondering whether, when moving from my 27inch iMac (current set-up but left side of screen has gone dark) to 2 24 inch monitors, I’ll notice a significant drop in screen resolution. @Patrick M: Did you have any trouble daisy-chaining the two Thunderbolt displays? I assume they are not merely mirrored? I ask because I’ve seen other forums in which people say they can’t connect two Dell 27inch 2560×1440 displays to a 2012 Mac Mini. Is this sort of combination only possible with the Apple Thunderbolt daisy-chained set-up? Hi Richard, I have no issues daisy-chaining them. I have a 256GB SSD as well as 16GB of RAM. Each display uses 1GB of VRAM, so even with 3 VMs and all of my apps running, I don’t have any display issues. I love that desk that you have. Do you happen to know the brand? Hi Lee, it was 100% custom. My brother-in-law used to run a granite business. This was one of the custom-made desks he had. When he downsized the business, I got to have it. It’s 3’4″ throughout with a 3/4″ build-up around the edge, which makes it appear to be 1.5″ overall. It weighs the better part of 400 lbs.